Hello and welcome to the Top Dog service animal page. We specialize in training Diabetic Alert Dogs (or DADs). Over 29 Million people are diagnosed each year with diabetes, and many are left feeling like their life is outside of their control. A DAD can help you take back that control so you can have more freedoms to enjoy life. Our hope is that every DAD we place helps someone feel like they can now manage their diabetes and sleep a little easier at night. The Current Percentage of Americans Diagnosed with Diabetes. The number of type 1 diabetics that will be hospitalized this year. The Current Percentage of Premature Deaths Attributed to Diabetes in the United States. Diabetes is the 7th leading cause of death. This is why we do what we do... Until there's a cure, there's a dog. When do the DADs alert? How Do The DADs Alert? A Diabetic Alert Dog (or DAD), is a dog that has been specially trained to detect dangerously low or high blood glucose events in a person. This is done through odor detection training, meaning that the dogs are able to smell these significant changes in the blood sugar of the patient. When a dog alerts to a low blood glucose event they are detecting a rise in the chemical Isoprene. Isoprene is a common chemical found in every human’s breath, but when our blood glucose level drops, our isoprene level rises. These rises become more dramatic as the glucose continues to drop. Isoprene is completely undetectable by humans, but miraculously enough dogs are able to smell it. When a dog alerts to a high blood glucose level they are detecting high ketones in the body. Ketones also affect the breath of a human just like isoprene, and in fact cause the patient to have a fruity or sweet smelling breath. Detecting a high blood glucose event is much easier for a dog than detecting a low because of this prevalent odor that is given off in the breath. Here at Top Dog we train our DAD’s to alert to medically significant (or dangerous), blood glucose changes. This usually means that we train the dog to alert you when your BGL reaches 70 or below for a low blood glucose event. High blood glucose events seem to affect many of our clients differently so it varies somewhat from client to client, but we typically train the dogs threshold around 250-300 BGL and above. The most common alert that we teach is for the dog to paw their owner on the leg when a dangerous blood glucose event is occurring. This is something that is easily noticeable by the client, but also indiscrete enough that it’s not going to cause a disruption at school, a restaurant, work, or any place in public. It’s also easy to teach the dog to start pawing harder if you don’t respond so that they can wake you up if you happen to be asleep during the event. Would you like to learn more about us? Join our mailing list for regular updates, training tips, and information. The video to your left describes in great detail what it’s like to get a diabetic alert dog from us. We believe that the process is best performed when we work with the client and the dog together from day one. We don’t offer fully trained adult dogs anymore. Instead we help you select a puppy that shows the proper aptitude for this kind of work, and we begin working with it from a very young age. Throughout the puppy’s early life it will spend periods of times with us to learn new skills, and then go back home with the owner to practice those new skills. This cycle will continue until the dog is fully trained. Click here to be taken to a secure server where you will be able to fill out your application to begin this amazing journey! The 3 most important things you can do before getting a diabetic alert dog is research, research, and more research. There are so many different styles, formats of training, timelines, etc., to consider before you decide to take on the life changing commitment of getting a service dog, and working with a service dog organization. Unfortunately there are also those who prey off of the disabled and will happily accept your money while providing you with nothing more than a glorified pet. Do your best to meet with the trainers, talk to references, and visit the facility where your dog will be trained. Our training program is not the right fit for everyone, and we don’t believe that any one organization can provide for the training needs of everyone, but we do believe that for the clients we work with our training program is the best for THEM. Who should consider getting a diabetic alert dog? A DAD is not for everyone. We specifically train our service dogs for those who are hypoglycemic unaware. Hypoglycemia unawareness does not affect all diabetics. Some type one diabetics are still very capable of feeling major blood glucose events, and thus there need for a dog is greatly lessened. However, for those who are unable to feel these shifts, a diabetic alert dog could prove to be a major help in helping to manage this difficult disease. How long does it take to train a diabetic alert dog? Due to the fact that our program not only relies on our training and expertise, but also your ability to work with the dog, this can vary quite a bit from one dog to another. We also have to keep in mind that every dog has individual strengths and weaknesses, and these can speed up or slow down the process. Our average DAD undergoes about 1600 hours of structured training between our facility, and the training you will be doing at home. They usually complete their intensive training around 2 years of age. One thing to keep in mind is that DADs require a lifetime of “maintenance” or follow up training that you will do a couple of times per week for the entire working life of the dog. 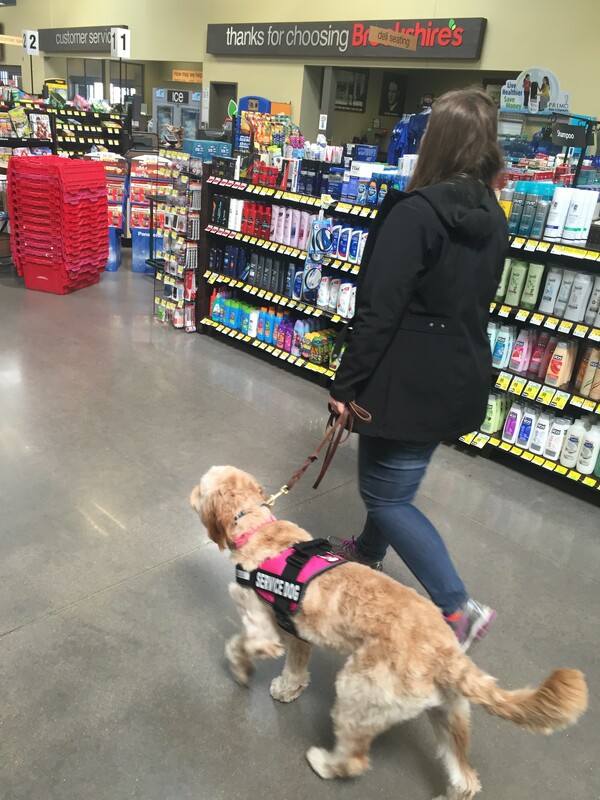 How Much Does A Diabetic Alert Dog Cost? This is a tough question to answer! The cost of a service dog from us will vary greatly depending on your time, abilities, and commitment to training your dog. One of the benefits of our cycle training program is that we’ve been able to bring down the costs down substantially over what we used to have to charge for a fully trained dog. Training a diabetic alert dog can take up to three years (although much of the last year or two is more fine tuning). When we used to offer only fully trained diabetic alert dogs we charged $25k-$30k. That may sound like an incredible amount, but when you break it down and realize that these dogs saw a minimum of 1600 hours of training, they ate premium food the entire time they were with us, we paid for their medical expenses, bathed them twice per month, give them multiple potty breaks and play time every day, etc., you quickly realize that we were actually getting paid much less than minimum wage for our work, and it would not have been possible without the help of volunteers. Now with our new program people are sometimes spending less than half that much, and they are able to spread the cost out over the course of the program instead of having to pay for it all up front. It has been hugely beneficial for both us and them. Our price structure is now set up like this: Each time your dog needs to come and stay with us for training you will be charged $100 per day. During the dog’s stay with us it will be focusing on obedience, public access training, and of course scent alert training. When your dog completes a stay with us you will be given a thorough lesson on everything the dog learned, and what is expected of you when the dog goes home (essentially you’ll be getting some homework). To clarify our price structure further I’d like to give you two real examples of clients of ours (with the names changed). Both of these clients started around the same time, are having great results, but are following very different plans due to the freedom our cycle training program allows. Example 1: The Red Family started with an 8 week old puppy that we selected for them. They are a retired couple in their early 60’s and the wife has been a type one diabetic for 37 years. They are still very active, and needed a dog because they want the wife to be able to keep her independence so that they can continue to enjoy many of the activities that they participate in. Their puppy started with a three week stay to begin the training process (cost $2100). The puppy then went home with them for a month while they worked on the exercises and training that we showed them. We of course continue to stay in contact via phone and email support. When the puppy was four months old they came in for a private session to get some pointers on a few behaviors, and some ideas for what their new expectations should be now that the puppy is maturing (cost $100). Due to the freedom of their schedule they were able to devote a lot of time to training their puppy so their progress was fantastic, and another training cycle at our facility was not yet needed. They came in two weeks later to make sure they were staying on track, and again make some slight adjustments to their training exercises (cost $100). At 5.5 months old they dropped the puppy off for a two week cycle at our facility so that the puppy could begin making the transition to alerting with their paw and get out of the scent imprinting stage (cost $1400). Again they received thorough instruction when the puppy went home and they were able to start working on their new skills right away. They continued to check in and we helped to monitor the process. They did not need another lesson until the puppy was 8 months old and we did another private session (cost $100). Again at 1 year old the dog came to us for another 14 day training cycle (cost $1400) to polish up some of the public access requirements and work on getting more reliable “live alerts” (when the dog alerts the owner without any prompting) . After that we saw them typically once a month for the next year for a private session to keep them on track and progressing well (12 sessions at $100 each equals $1200). So The Red Family had a total investment of about $6,400 into their training program. Still a big investment, but they were able to spread it out over the course of two years, and it was very manageable for them. Example 2: The green family also started with an 8 week old puppy that we selected for them. They are a very busy family in their 40’s with two children. The husband has been a type one diabetic for 12 years. They knew that with their busy schedules they would not be able to devote as much time to training every day so we made a plan from the beginning that for the first 18 months of training (which is the most labor intensive time), the dog would train with us for one month, and then go home for two months, and then come back to us for a month, and back home for two months, etc. So they spent a total of $16,800 on training cycles, and then an additional $1,100 on private sessions for a total cost of $17,900. Obviously these two families chose vastly different styles (but both are still successful), and that’s the beauty of our program. It allows you to control the gas and the brakes somewhat. As I mentioned earlier the other real benefit of this type of program is that you get to pay as you go. You don’t have to come up with a huge amount of money up front. Every time you sign up for a training cycle you pay at that time, and you don’t have to prepay for future training cycles or anything like. Our training cycle program also makes fundraising much easier as well. The vast majority of our clients fundraise at least half of their training expenses, and they are able to raise that money as they go. We have an in-house fundraising specialist who can help you with setting up a fund raising program for your family so that these costs don’t necessarily have to come out of your own pocket. One of our clients did an amazing job of fundraising and was able to raise over $20k in just 45 days. This ended up covering not only the cost of their training, but also the dog’s food, crate, medical expenses, etc. Not everyone is able to do that so quickly of course, but with the support of a great church, an impressive school program, and a really tight knit community they were able to pull it off with ease. Do you place dogs all over the country? Our training program involves the future owner of the dog from day 1. Once you are accepted into the program you will need to visit the training facility somewhat regularly, and we may need to visit you at home occasionally. Due to this fact we rarely work with clients outside of a five hour radius of our facility unless you are able to demonstrate to us that you have the financial means, the time, and the commitment to still be able to attend your training sessions when necessary. Here at Top Dog we try to provide videos of us in action whenever possible. We hope you enjoy watching us work, as much as we enjoy working. Here’s an example of an early alert session with Bentley. Prior to this he had only learned that he had to sniff the scent sample in order to get a reward. Now, the rules have changed slightly and he has to sniff first, then paw, before being rewarded. Saliva samples are crucial to the scent training of a DAD. Using incorrect practices, or contaminating samples will quickly confuse your dog. In this video we demonstrate how to collect samples appropriately. The very first step of training a DAD can begin when they are still VERY young. Check out Zeno as he has his very first session of scent imprinting which will teach him how to discriminate between a healthy blood glucose level and a dangerous one. A diabetic alert dog needs to be exposed to all sorts of sights, sounds, and other stimuli. That means even when we go on vacation, we’re still training. Bentley recently joined Adam and his family on a vacation back to Indiana where he got to experience lots of things he’d never seen in Texas before! Drop us a line anytime, and we’ll get back with you as soon as we can.